Poker tells for online and live games, which will help you read others and win more! Gain an edge with poker tells at your disposal! Poker tells can give you a lot of information about the strength of your opponent’s hand not only when playing Texas Holdem, but in other games as well. Therefore, you just have to concentrate your attention on the game, and you will be able to spot many useful hints. Obviously, there are no guarantees that player is bluffing or not based just on his actions. However, if you take your time to notice and remember most obvious tells, you can have an even bigger edge over your competition. Online and live poker tells are a bit different and for obvious reasons, you have much more to consider while playing live because you see your opponent, what he does, how he reacts and much more. But even if you are playing online, building the basic understanding of poker tells can help you make the right decisions. So let us cover it firstly. As we said, you have way less option to read your opponent online compared to live games. However, some of the ways are very powerful and can give you a lot of information. Most importantly an accurate one. It is by far the most important, yet, probably the hardest thing to understand and master. You can even find advanced courses developed on the subject and learning these concepts can help you build an optimal bet sizing strategy. Sadly, there is no rule, which could be applied in every situation and give you guaranteed results. However, a few things stand out. There are many spots in which your opponent would never play value hand with a particular sizing. For example, if your opponent decides to overbet shove huge on dry boards, he is unlikely to be bluffing. Probably most players understand that in this case, your range is polarized and you have either a very weak or a very strong hand. If you have a poor holding, you will be letting it go no matter how much he bets. Therefore, if his goal is to make you fold, he will never risk his entire stack to do that. However, if you have a strong hand you are likely to bluff catch him, and he could be trying to get maximum value by betting big. So if your opponent bets huge on a dry board, he is more likely to have made hand than a bluff, and you should consider folding unless you can beat some of his value hands, which he could play this way. Second thing, which you want to remember is that people are unlikely to bluff with a tiny sizing. Most of the time, when you are facing a small bet, it will be for value. Therefore, if you do not have anything, folding is a reasonable option. However, you need to take into consideration, that some good regulars use these sizings as a bluff, just because they know you will not think they are. Well, it is tough to read professional players and let us not move in these leveling games. So you should be concentrating on breaking down tough opponent’s ranges of cards and playing against it while leaving poker tells for weaker ones. In some rare cases, players can play contrary to this, so it is better to get more info on your opponent before judging your decisions just on bet sizing. That being said, it is by far the most important concept, which you can learn to identify the strength of your opponent hand. Timing is another crucial part of the information, which you can use to your advantage. Many players take this lightly and leave a lot of valuable information on the table. Just think about your play in general before going even deeper. Do you act at once when you have a strong hand? Unlikely, so most of your opponents will not do that as well. Therefore, one of the classic poker tells is that if your opponent acts fast, he likely has a weak hand or a draw. In this cases, he does not need to spend any time to consider his options because he is not going to fold his draw and he is not going to raise a weak holding as well. Therefore, his only option is to call and hope to improve. Subconsciously he makes that decision in a blink of an eye, and that translates into quick action on the table. Contrary could be said about acting slow. As we discussed before, your opponent will be playing medium strength hands faster, so when he takes a lot of time to make a decision, he likely has a very weak hand or well above an average one. One thing that I have noticed repeatedly is that when your opponent thinks for an extended period and then checks, he is likely to fold to any aggression. Therefore, you should often be betting as a bluff when you see this. Considering this along with all other factors such as position, action before the flop, community cards and bet sizing can give you an excellent understanding where your opponent stands, and you can make an accurate decision based on all of it. On top of that, for online players there is a lot of help from different poker tools, so make sure to use it to boost your advantage. A sure way to identify a recreational player in the cash games is to notice his behavior and stack size. Obviously, it will not indicate the strength of your opponent hand, but knowing who is a regular and recreational player will give you a significant advantage early on because you could be playing entirely differently against them. So when you see someone at the cash game table holding some stupid amount like 86.74 big blinds instead of 100 BB when it is allowed, you can be confident that you are facing a recreational player. Alternatively, he could be a professional short stacker as well. But you will be able to identify which one is true very quickly. Short stackers play very tight and aggressive while recreational players tend to choose a more passive strategy and if you see him limping or playing many hands, you can just confirm that this guy is likely to be a recreational player. By the way, limping is another habit of weaker players so when you see it, play accordingly. In addition to this, when a player does not have auto rebuy option marked where it is possible, he is almost surely a recreational player as well. Most good regulars want to play with a full stack to maximize their chance of winning big when they have a hand thus be turning auto rebuy on to top up their stack if they lose some money. Same goes when you see someone posting big blind out of his turn. You probably will never find a regular doing it so this could be the most accurate online poker tell helping to identify the weaker players in your games. Obviously, you cannot rely just on poker tells and need to know how to build a winning cash games or poker tournament strategy if you are playing those. However, you can surely get a lot of additional information from live poker tells and confirm or deny your decision based on that. To be honest, these insights play a big roll in live games, so better know what it means. To get that extra edge you can read more poker tips here, and for poker tells let us continue with a list. You can apply most of the same bet sizing rules as for online games, so I will not repeat everything again. However, one noticeable difference comes with a fast action. In live games, people are much more likely to act quickly with a strong hand. Especially when they are the aggressor and are dictating the action. When you find yourself facing a snap shove on the river, probably you will see a reasonably powerful hand. Most of the time your opponent already decided to bet no matter which card comes even before seeing it. Therefore, he is unlikely to be bluffing here. It is probably one of the best-known live poker tells, so I cannot leave it aside. While having a strong hand, people tend to act, as they do not. Therefore, when you see someone acting with a lot of power, splashing chips and indicating a strong hand in any other way, they are very likely not to have it. In this case, you should be looking to call down even without a premium holding. This one indicates strength. When people bluff they naturally want to hide not to give away any tells. Obviously, it is subconscious thinking, and they are not going to hide under the table. However, they will be scared to look directly into your eyes, and when this happens, they are more likely to have a strong hand than not. Another thing, which you should be afraid of. When someone starts talking while it is your turn to act, it shows a lot of confidence in his or her hand. Most of the time players are not going to risk giving away that they have a weak holding while speaking to an opponent in the middle of the hand. Obviously, it does not mean that your opponent is bluffing when he keeps quiet, but when he talks a lot, it surely indicates some strength on his part. Our previous point leads to this one. People are not likely to talk while bluffing because they do not want to give you a hint of their holding if their voice starts to break. It is a clear sign that they are not comfortable and could be bluffing. Same goes for freezing after making a bet. As with a shaking voice, players to not want to give anything away. Some of them hide under the hood, while other freeze and try to maintain the same position no matter what you say or do. Therefore, this could indicate weakness as well. Quite a simple, yet important one. It almost always means that player is looking at suits of his hand. It is close to impossible to forget if your hand is suited, just because you only have four options for that. Therefore, if you see someone rechecking a hand, it is very likely that it is offsuit. For example, on a three flush board, people tend to check if they have one suit that is the same type as three in community cards. So in this case, you are very unlikely to be up against a made flush and can base your decision on that. It is a highly common poker tell, which you can see much more often than you can imagine. All you have to do is take your attention and watch every player when he is looking at his hand for the first time. If you notice that someone stares at it for an extended period, you can be almost sure that he does not have a premium holding. When players see a strong hand, they try to hide it and often release their hand at once while trying to act naturally. Thus when you notice someone looking at their hand longer than usual, you can bet that he is on a weaker side. Same goes for watching the board. If you notice someone staring at the flop, turn or even river and then making a bet, you can call him with a weaker holding because this is not likely to happen with a strong hand. If community cards improve your holding, you are sure as hell, not to be staring at it for an extended period. You will subconsciously look away because this is what most players do when they improve. Contrary to previous tells, when someone suddenly looks at the chips after seeing his hole or community cards, he is more likely to be strong. People act this way when they are seeking to bet. Thus this action indicates more solid than usual holding. When someone shows interest in the pot and concentrates on every detail of the hand, it means they are looking to play it. Therefore, when you notice someone looking at every player, counting the pot, checking everyone’s reaction they could be waiting to play their hand. Contrary, if someone takes out his phone after seeing hole cards and starts reading something, you can be certain, that he is not going to play the hand and has no interest in the pot. Some players just cannot take it and gets too overwhelmed after getting a premium hand. You can see them making a bet with a shaking hand or dropping chips in some cases. If this is the case, your opponent is very unlikely to be bluffing. I am not sure if I ever saw a bluff after calling a bet from someone with shaking hands. Therefore, unless you have an excellent reason to call or incredibly strong hand yourself, you can consider folding even a reasonable holding in this spot. If you spot one of these poker tells, it should not be a direct indication of your opponent’s hand strength. However, if few of these points leads to the same direction, it is quite likely, that you spotted something valuable. Remember, that players tend to act in a way that could convince you of their holding and they can easily fake one poker tell if they have it in mind. However, it is extremely hard to fake few at once, so you should be willing to go with your guts if you spot it. Obviously, poker professionals can fake these tells, but it is extremely hard for any recreational player. You need to consider many things when pretending in one way or another, and most of the time you need to fake few things at once, so it is very unlikely to happen. Therefore, I highly recommend looking into these poker tells to gain extra information about recreational players and to play good solid strategy against the PROs! 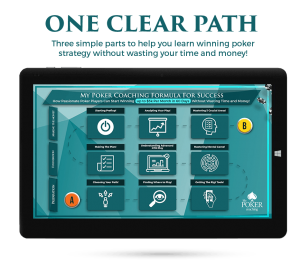 If you want to dig deeper into advanced poker strategy, learn more about live poker adjustments, TELLS and other vital concepts, you can always check out my complete training program “Crush Live Poker” and make your life even easier at the tables!